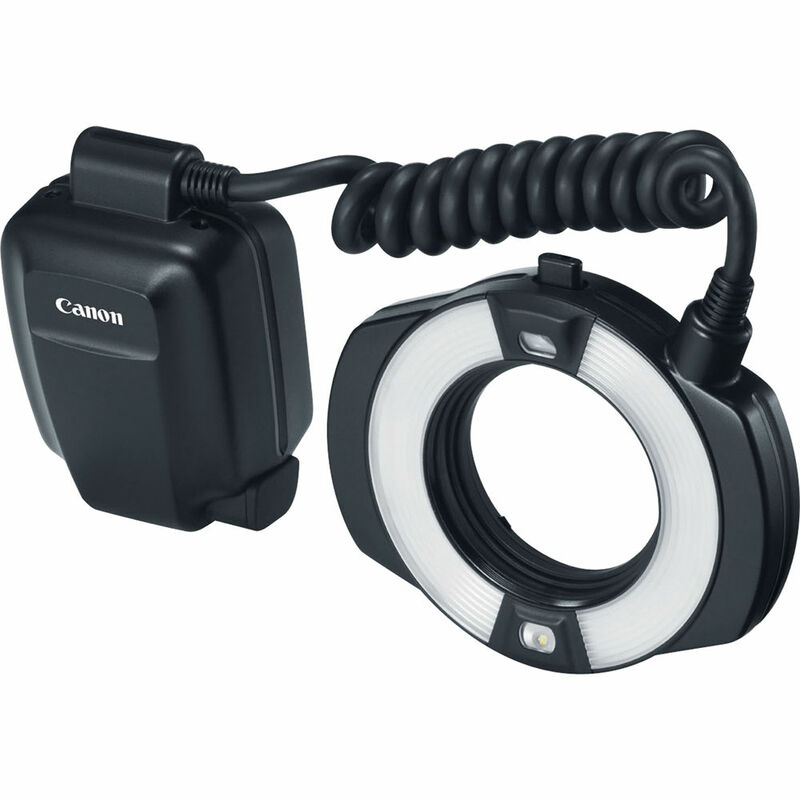 The MR-14EX II Macro Ring Lite Flash from Canon is designed for use with Canon macro lenses for close-up photography. With a guide number 34' at ISO 100 per side, its twin tube design allows each flash tube to fire independently, or simultaneously to provide a combined guide number of 46' at ISO 100. White LED focusing lamps and two types of modeling lights allow for accurate previewing of the light's effect. An illuminated dot-matrix LCD screen lets you make adjustments to the flash in both bright- and low-light situations. The MR-14EX II has 12 custom functions, and supports wireless E-TTL when linked with one or more Speedlite 600EX-RT flashes. The ring flash can be powered by 4x AA batteries or an optional CP-E4 battery pack. Box Dimensions (LxWxH) 8.6 x 6.5 x 6.45"
MR-14EX II Macro Ring Lite is rated 4.7 out of 5 by 27. Rated 5 out of 5 by Anonymous from Fantastic Ring Light I shoot multiple off-camera radio controlled Speedlites in a variety of ways, but never really delved into macro lighting. This Ring Light is amazing and makes it so easy to shoot great hand-held macro at 1:1. It changes the game and allows for hand-held macro shooting with great ease using ETTL flash. Just set the camera aperture to f/22 or f/25, speed at 1/200 (max sync) and ISO 1000. That gives you the movement freezing result at a decent DOF. No need for a tripod which is always difficult with macro outdoor shooting. It darkens the ambient background light and creates amazing perfectly lit results at 1:1 macro if you have a good macro lens. Macro shooting is always low light shooting because of the tiny apertures and fast speeds required. This ring lite has amazing results, all using simple TTL. I just wish it had the radio signal capabilities of the 600 Speedlites. Rated 4 out of 5 by Waldo from Much better than the older model I have used the previous ring flash extensively and this flash is a very welcome upgrade. It uses much brighter LED lights for the pilot (focussing) lights - the previous model's lights were pretty much useless. Also, the new flash recycles much faster. My only complaint is that it does not have weather sealing. Rated 5 out of 5 by Mark the cyclist from Excellent Flash I am using this flash with my Canon 6D for macro photography. The flash is working great. I was able to easily adjust the strength of the flash for a very nice exposure. No complaints so far. Be sure that you purchase the 67mm adapter as it does not come with it. One salesman mentioned it the other did not but you will not be able to use the flash without it. Rated 5 out of 5 by Anonymous from Great This is a versatile flash. mostly used for macro photography but works well for informal portraits, I was surprised how light the unit is, I was very pleased with the flash. I recommend that all three of the adapter rings be purchased if you plan on using the flash for more then macro photography. Rated 5 out of 5 by Jack from Convenient for flowers and insects I love to shoot flowers, especially with insects involved. This allows me to do that and get a good depth of field, but also a quick flash stops the movements of the insects. I am getting very nice results. It is a bit heavy on my Canon 5D Mark III. Rated 5 out of 5 by Cosmetic Dentist from Great Macro Flash We bought this flash for dental photography with Canon EF 100mm f/2.8L Macro IS USM Lens and Canon EOS Rebel T6i DSLR Camera. It is heavier than the Nikon D70, Nikon macro lens and Nikon ring flash that it is replacing but the images have consistently better color and more accurate exposures. Rated 3 out of 5 by James M. from Lacking... I bought this for macro work of course. It's a reasonable flash unit, but it had some things I just couldn't get past: 1. That adapter! You'll have to use the adapter to mount this on your 100 mm macro lens. A huge pain as far as I'm concerned because the adapter tends to seize itself to any filters you've got mounted on your lens. 2. No adjustment for direction: You can only go one direction with this unit - straight ahead. The MT-24 offers that, but for a higher price. I feel this lack of adjustment limits the use of the flash, and since it's already a specialized unit, those limits were too narrow for me. 3. And then there's my pet peeve with all of Canon's flash units: No external dc power input. This is brain-dead beyond belief in my opinion, to build flashes that can *only* be powered by batteries (the high-volt dc external input doesn't really count because even if you use that, you still have to have batteries). Rated 5 out of 5 by Francisco Espinosa from Amazing Item I use this product daily and the results are close to perfection in ilumination in my area, dental photografy.